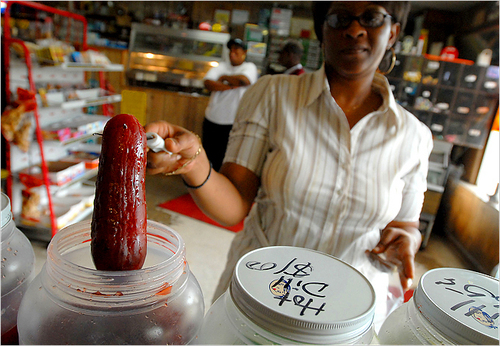 If you're going to be in the Mississippi Delta soon you may want to try one of the region's newest delicacies: a Kool-Aid pickle. We're not sure if they're any good but kids seem to love them. You probably won't find them on any restaurant menus but in mom-and-pop convenience stores throughout the region red jars full of dill pickles soaked in strawberry, cherry or tropical fruit Kool-Aid are becoming more and more popular. Above, you can see Berverly Boddie and one of her Kool-Aid pickles that she hopes to trademark soon and sell out of her Cleveland, Mississippi, grocery store. Yummy - maybe. Related posts: BBQ in your Pocket • Watch What You Eat • Top 10 Most Expensive Places for Your Date To Order a Salad • Heart Attack? No Reservation Needed • Taco Hunting on the PCH • Free Crack on the Fifteenth from Starbucks • Fear and Hope in Black Rock City • These Shoes Were Made For Drinkin' • Bubble Gum Alley in SLO • Hey Man, What are you doing for International Talk Like a Pirate Day? Hello!!! You don't know how long it has taken me to find out what this "KOOLICKLE" is. I was watching Alton Brown and must have rewinded the tape 20 times before i could get what he was saying. I was so happy to see your site. Not sure on the taste though, but one day I will be brave enough to try. Good Luck. I tried the cherry Kool-Aid recipe at home, but between me and my son, they didn't last long enough to get a good soak. Next time I will try two jars and stash them in the cool garage until they have enought time to soak through. I was pleasantly surprised in the flavor, the sweet of the Kool-Aid reduces the bite of the pickling brine and makes the pickles even more tasty than they already are. I'm sorry, but these were about the most disgusting things I have ever tasted. After the first mouthful of crunchy, vinegar, salt, cherry, garlic, and dill flavor I nearly vomited... I guess this is not for everyone. I searched for pickle, and found Kool-Aid pickles. It sounded weird, and was phrased "Koolickle". Found this, and now the question remains, Do I want my pickles tasting like cherries, or tropical fruit? Maybe, but I'll have to find a bland pickle to "juice up". The first thing you will need to do in order to make Kool-Aid Pickles, is drain the pickle juice off of the jar of dill pickles and into the empty gallon container. It's is realy a great post.Interesting and usefull,i get much benefit by it.